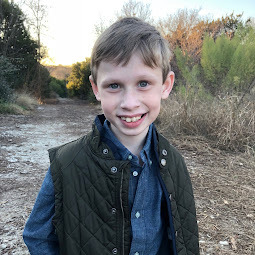 Bennett Brinson Gamel: Fighting Cystic Fibrosis: The Way CFers Measure Health Status - aka, how is Bennett's CF these days? The Way CFers Measure Health Status - aka, how is Bennett's CF these days? Bennett had his 3-month Cystic Fibrosis Clinic appointment last week. 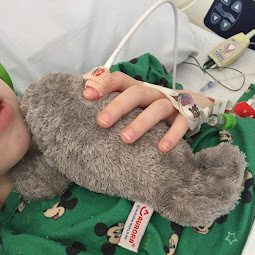 So, I thought I'd share a little bit about how that went and how that tells us how Bennett is doing with regard to his Cystic Fibrosis health. There are five primary measurements that the Cystic Fibrosis Clinic clinicians typically use during a regular CF Clinic appointment to determine how a CF patient is doing. 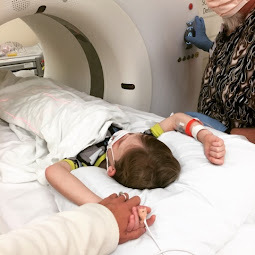 Each time we go to the CF Clinic (which is every three months when Bennett is healthy), Bennett has to go through a round of invasive testing to help the doctors determine whether or not he may be getting sick. One of the first tests Bennett must undergo are evaluation of his vitals. Bennett's fever is taken (to indicate current infection/virus) as well as his blood pressure. Bennett submits one of his little fingers for testing with an oximeter. An oximeter measures the amount of oxygen in his blood. Typically we want to see 100% but anything over 94% is best. Bennett's last oximeter rating was 99%. The second test often used to monitor CF weight loss/gain. Due to malabsorption issues in CF, Bennett's lack of weight gain has been an ongoing problem. At our last appointment, the doctor, dietitian and I decided to change his enzymes, increase his tube feeds and increase the amount of calories in his formula. These changes look like they are benefiting him. Bennett gained 2 pounds since our last CF appointment 3 months ago so this shows Bennett is doing well! The third test is called a Pulmonary Function Test or PFT (see video above). 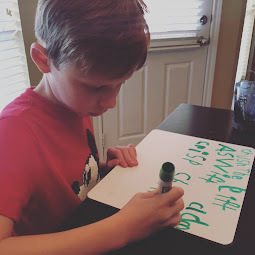 Children under 5 sometimes do PFTs for practice but CF patients under 5 typically do not do PFTs because they require good technique to provide an accurate reading. It requires taking a breath and then, as fast as you can, pushing out as much air from your lungs as possible. Our clinicians say a PFT FEV1 of anything over 80% is good. So, Bennett's blowing 90% for his first real time is excellent. He will get better at the technique in the coming years. Bennett's PFTs showed us his lungs are working at full capacity! Woo-hoo!! A fourth test we do at each CF Clinic visit is called a "throat culture." This is when the respiratory therapist or nurse puts really long cotton swabs against the back of Bennett's throat in order to get a culture of any bacteria that might be in his throat. This throat culture is sent to a lab. It takes several days to get the throat culture back but we typically learn within a week. Bennett showed no new bacteria or infection in his lungs (outside of typical Staph, which is normal in CF). SUCH A BLESSING!!! The last test that Bennett often undergoes at his regular quarterly CF Clinic visit is a listen of his lungs by the CF Pulmonologist Doctor. Our pulmonologist said Bennett's lungs sound great so we are not worried about any infections at this time. We go back to Dallas to the CF Clinic in July where we will go through all of these tests again. But, for now, we are celebrating the small blessings of weight gain, clean throat cultures and good PFTs! Like a seismograph to an earthquake, these tests indicate the beginnings of a lung infection and the progressive nature of CF. So, every single good test result is a blessing. Every. single. one. There are other measurements that tell us how Bennett is doing - such as chest X-rays, CT scans, bloodwork and his own feelings about how his body feels. But, these are our main indications of how things are going when everything else is looking good. The question I often get is, "How is Bennett doing these days?" And my answer is: We've made it to 5 years and 7 months with no lung infections. So, he continues to do amazing!